SEATTLE, 2017-Nov-08 — /Travel PR News/ — Alaska Airlines today begins nonstop service between San Diego and Mexico City’s Benito Juarez International Airport. San Diego is the third West Coast city to see nonstop service to Mexico’s largest metropolitan city with Los Angeles and San Francisco added in August 2017. 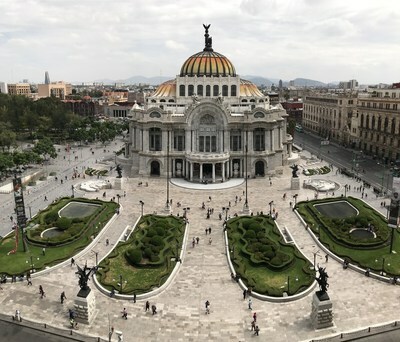 With more than 100 flights a week to Mexico from California, Alaska Airlines offers California flyers more flight options to Mexico than any other U.S. carrier. The year-round, nonstop service marks the ninth destination Alaska serves to Mexico. Other destinations with service from California include Cancun, Ixtapa/Zihuantanejo, Loreto, Los Cabos, Manzanillo, Mazatlán, Puerto Vallarta and Guadalajara. Alaskabegan flying to Mexico in 1988. The Mexico City flights will utilize Embraer 175 aircraft operated by SkyWest Airlines. Onboard, guests will enjoy Alaska’s award-winning service, along with features to help make the most of their flight. Alaska Beyond Entertainment offers over 200 free movies and TV shows direct to customers’ own devices. Other onboard amenities include a selection of food and beverage inspired by local chefs, custom leather seats with adjustable headrests and power outlets in the first class cabin. “I congratulate Alaska Airlines for providing a new opportunity for business and leisure travelers to experience the many culinary, artistic and historical landmarks in Mexico City and throughout our country. San Diegans and Mexican nationals, as part of the vibrant Cali–Baja region, will enjoy this convenient connection,” said Marcela Celorio, consul general of Mexico in San Diego. To purchase tickets on Alaska Airlines, visit www.alaskaair.com to find great savings, or call 1-800-ALASKAAIR (800-252-7522 for Hearing & Speech Impaired (TTY): Dial 711 for Relay Services). Editor’s note: High definition b-roll of Alaska Airlines aircraft can be downloaded at https://newsroom.alaskaair.com/multimedia. Alaska Airlines, together with Virgin America and its regional partners, flies 40 million guests a year to more than 115 destinations with an average of 1,200 daily flights across the United States and to Mexico, Canada, Costa Rica and Cuba. With Alaska and Alaska Global Partners, guests can earn and redeem miles on flights to more than 900 destinations worldwide. Alaska Airlines ranked “Highest in Customer Satisfaction Among Traditional Carriers in North America” in the J.D. Power North America Satisfaction Study for 10 consecutive years from 2008 to 2017. Learn more about Alaska’s award-winning service at newsroom.alaskaair.com and blog.alaskaair.com. Alaska Airlines, Virgin America and Horizon Air are subsidiaries of Alaska Air Group (NYSE: ALK). This entry was posted in Airlines, Airports, Flights, Travel, Travel Services, Travelers and tagged Alaska Airlines, Benito Juarez International Airport, Mexico City, San Diego. Bookmark the permalink.